This is reflected in the Hidden Springs land plan, which includes numerous environmental precautions and improvements, over 800 acres of permanent open space, and on-site retail and educational facilities to minimize car travel. 1. Rural character and farming traditions: We will maintain the rural traditions of the property by incorporating older out buildings into our landscape designs where practical, and allowing some of our open space for appropriate agricultural uses. 2. Small town: Traditional neighborhood design will be the foundation for the small-town lifestyle. 3. Natural environment: We will respect the natural environment. 4. Traditional homes: We will encourage the design and construction of homes that are comfortable and long-lasting; homes that will use energy and resources efficiently and responsibly. 5. Quality of life and healthy living: We have set aside, and will care for, large and diverse areas for outdoor living and recreation. 6. Education: We believe quality education starts at home, and we will support neighborhood schools and lifelong learning opportunities. 7. Diversity: We will offer a variety of homes so that people of many ages, incomes, and backgrounds can live at Hidden Springs. 8. Value and values: We will create a community that will provide enrichment, enjoyment, and value for many generations to come; a place where you will be proud to watch your grandchildren grow up. In 2000, efforts were recognized when Hidden Springs received the prestigious Best Smart Growth Award from the National Association of Home Builders. Yes, the scenery here will take your breath away. 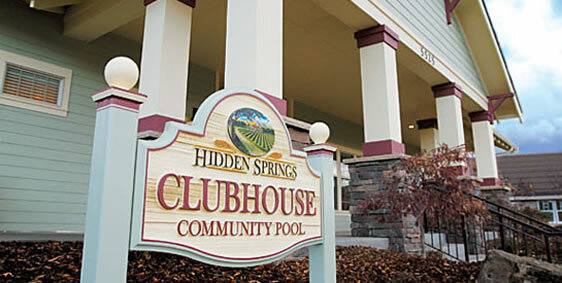 But what makes Hidden Springs even more livable are its practical amenities. Out of milk? You’ll find it at the Mercantile. Need to mail a package? We have our own Post Office. Want a hot cup of coffee? It’s waiting for you at our Mercantile. All within an easy walk of your home. And with an on-site charter school (K-7), two community pools, DSL connectivity, miles of hiking and biking trails, why would you settle for less?